Every parent likes to take some time out with their kids for good times and bonding over meals. Take your kids to restaurants where they will appreciate the food and the activities around that they can engage in. Good family restaurants have playgrounds where kids can play different games, theme décor, food pleasing menus (with different healthy items) and other fun activities. Below we’ve outlined the 19 best restaurants to visit with your kids in 2018! This place has three buildings and a drive in that has existed for about 50 years. You can either drive in or eat in the car as there are such services or dine inside the building. Food in this place is delicious with menus such as pizza, subs and dinners. It is an ideal place for kids because of the picnic area. Serve and eat at the picnic area, you don’t need to worry about telling the kids to sit down as they are free to move around. Eating here will not break your bank, especially if you are on a tight budget. Kid’s menu prize is $3.8. Foods such as buggers, mac n cheese wedges and hotdogs all served with 100 Oz of drinks and a plate of fries. Planet Hollywood is a celeb worshipping restaurant in a tourist setting. It offers American foods such as spaghetti and cheese pizza which are kids favorite. Kids will get an opportunity to checkout Hollywood’s famous films such as The Titanic. They serve German food washed down in a pint. The Rathskeller also has non-German foods such as pizza and chicken wings, kids’ favorites. It is a good family restaurant where local bands play music, usually blues, acoustic rock and polka. Enjoy dining indoors with your family at Kellerbar or Biergarten. It serves tantalizing meals such as grilled cheese, pasta and hotdogs with different side orders up to twenty choices. The kids’ menu price is at $4.95 and adults at $ 5.50. There is a variety of schnitzels and other German wurst for adults to enjoy. The restaurants stay open until 10 pm. An old school model train runs throughout the area. Bring your kids to enjoy being brought appetizers and drinks by a model train. Pizza is kids’ staple food when they are out. Kids’ meals include chicken nuggets, corn dogs, mac n cheese, 7-inch pizza and quesadillas at $ 4.99. There are game stations at each booth and restro arcade games that fit 50’s theme that kids enjoy so much. It is opened from 10 am to 3 am throughout the week. It has the best restaurants for kids with delicious organic, farm to table produce. Bring them to visit cows in the pasture or those roaming around the area. All snacks and foods are made from the farm; ice cream, apple pie, chocolate milk and pumpkin pie. Let your kids enjoy the beautiful grounds and experience of dining while overlooking the 19th Century barn. For eggs Benedict and real burgers, pass by the Loft Restaurant and Dairy Bar that specialize in local food. A number of times they have patrons visiting from time to time. It is opened from Monday to Saturday and closes latest at 9.30pm. Bring your kids to dine in the outdoor garden at Mama Carolla’s when the weather is warm. When it is cold, you can dine inside with beautiful twinkling lights. A particular hit is the chicken lasagna marinated with rosemary, a touch of fontina cheesesauced in herb champagne with a touch of mushroom, fresh spinach and chicken Involtine. Kids can enjoy smoked cheese and bruschetta, an Italian dish, bread marinated with tomato at $ 4.99. Adult menu ranges between $16 and $20. The restaurant opens between 5pm to 9.30 pm every day except Mondays and Sundays. Take your kids to this sport serving burgers and other American classics for a taste of rock and roll energy. The kids menu includes the toddler foods. 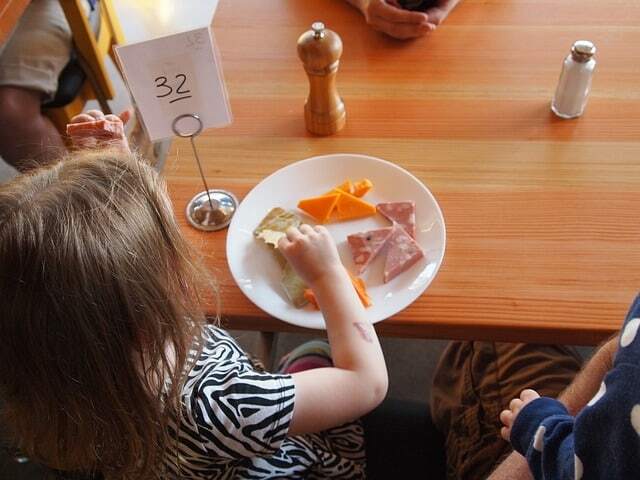 It is one of the best restaurants for toddlers to visit without worrying what you would feed them. For sure your kids will get their taste buds jumping when they take one of these delicacies in the kids menu. Chicken tenders, cheese pizzas, fish sticks, hot dogs, banging burger, grilled chicken breast and mac’ cheese are on the menu. The Jackson family of five has been dedicated to the back room. It opens from 11am to 11pm everyday except Friday and Saturday when it closes at 12am. Taking kids to the Old Spaghetti Factory is an experience they will never forget. Let them order for pasta dishes and dine in a trolley car. Moreover, they pay attention to details that impress kids such as the stained glass, antique lighting and dining in the old bright red trolley. The kid’s menu dishes include; spaghetti with meat sauce, Rivioli, Fettuccine Alfredo and mac’ n cheese, among others. All foods in the menu go for $5.99 served with apple sauce, vanilla ice cream, milk and soft drinks. Lunch during weekdays is from 11am-2pm while Saturday and Sunday is from 12pm-4pm. Open for dinner from 5pm-9.30pm Monday to Thursday. On Fridays dinner is at 5pm -10pm while on Saturday 4pm-10.30 and Sunday 4pm to 9.30pm. The restaurant offers kids’ favorite foods such as burgers, pizzas and Calzone. Everyone’s choice is catered for including vegetarians. Spring water is used to make dough for one of the tastiest stone baked dough. The beef here is natural with no steroids and hormones. Mellow Mushroom has an open plan kitchen where your kids get the opportunity to watch chefs throw dough high. It is open on Friday and Saturdays 11am to 10 pm and Sunday to Thursday 11am to 9.30 pm. Bring your kids here to choose from a variety of gourmet burgers.The place is jumpy and crowded with music in the background eliminating any embarrassment you would have from your kids’ winning. Children also like noisy and busy environments; they often concentrate on what they can watch. There is no specific kids menu but you can order for them buttermilk fried chicken tenders at $8. The Mexicali with its guacamole being the most popular burger, price ranges from $8 to $12. Bru do glutten free options too and a variety the kids can choose from. There are some very good salads to choose from as an adult as well: cranberry poppy seed dressing, candled pecans, Gogonberry Pecan with spring greens and crunchy bacon for sweet salty pop of contrast at $5. These chains of restaurants have a buffet style of eating, encouraging kids to be adventurous eaters. The restaurant has a 55-foot salad bar that serves eight different soups made from scratch and four kinds of salad tossed after every 20 minutes. This restaurant is a fun place for kids as it gives the opportunity to create your own salad from 30 ingredients on the bar. Whole wheat biscuits, fresh fruit, low-fat muffins and frozen yoghurt are also available. A family of four can eat at $25 which is pocket friendly. Look out for the balloon artists and clown events organized for kids’ night. Zip City is a fun place for kids to be. Bring your kids here for various games from trampolines, rock wall climbing as well as laser tag. The food is simply acting to refuel them as they go back to play. Usual beverages, pizzas, hotdogs and burgers are what to expect here. The place is closed on Mondays and Tuesdays and opens on Wednesday from 3.45-8pm. For discounts visit Zip City Indy on Thursdays when 3 hours of fun goes for $21.95 and a free T-shirt, opened from 3.45-8pm. It opens on Fridays 3.45-10pm and Saturdays 11.45am to 9pm. The early shows are kids friendly. Every show is different as it is comedy and kids’ audience participation is encouraged. Bring your kids here for laughter and fun. Foods include; cheese burgers, sandwiches and grilled chicken at $6. It is served with regular chips, BBQ and a pickle. Kids enjoy pretzel at $3 and nachos with cheese at $3.50. Adults can also enjoy cold beverages such as beer, wine, hot beverages and soft drinks for your children. Make sure you book early as the show sells out quickly. Opening times are on Thursday, Fridays and Saturdays at 7.30 to 9pm for kids shows. You don’t have to pay the admission fee to get inside the museum. You can dine outdoors during warm weather while looking over the canals and walkways. The nacho potions here are big enough for two kids to share. Let them enjoy pizzas and pulled pork sandwiches from best men for museums. Sky City Café is best for kids for lunch. When you visit Downtown, don’t miss out on the fun the kids can derive from here. The place opens from Monday to Saturday from 10 am to 5 pm and on Sundays 12am-5pm. This is a busy and crowded place. Bring your kids here to dine while watching sports. Beef burgers, fish and chips are the foods on the menu as patrons love sticking to the basics. Although there is no specific kids menu, the famous foods for kids here include burgers served with waffle fries or French fries. Prices range from $10.50 to $12.50. You are guaranteed to enjoy your time here with your kids. The place is opened on Sunday to Tuesday from 11 am to 12am and Wednesday to Saturday from 11 am to 1 am. Bring your kids here for snacks or breakfast. This is the place where your kids will have fun making their own choice of foods. All the foods are well displaced and attractive to the eye. It is opened Monday to Friday from 5am to 5pm and on Saturday 6am to 4pm, Sundays 6am to 3pm. Located in the Downtown in Indiana, this place is well known for its value for money. It has a bright interior with tropical leaves painted on the walls, making it attractive for kids. You can choose to sit in the outdoor area. Come and enjoy some yellow and massaman while the kids enjoy pad Thai that is not spicy and crispy springs. With $7.99, you can order for a spring roll, soup and an entrée, which is amazing. It opens Monday to Thursday from 11 am to 10 pm, Saturday 12pm-10pm but closes on Sundays. Tavern on the garden in New York City is one of the restaurants for toddlers to go to as well as a welcoming restaurant for families. It has a lot of items on the menu and a good outdoor space with charming umbrellas where small children can roam around and enjoy nature. You wouldn’t have to worry about your kids getting loud and noisy. Food is much better than you would expect of a friendly, accommodating and patient staff. In addition, there is a tourist clogged location where parents can enjoy a delicious fare in the historic location. The foods here will surely not disappoint you; eggs Benedict Florentine, complexity of a fig and goat cheese salad and organic salad bathed in a chive beurre blanc served with lentils. While at Tavern Garden don’t miss an opportunity to visit the Central Park setting with your kids to let off steam before and after lunch. For more fun with the kids, after a walk in the park with some kids games, order the decadent birthday cake. This cake is rich in cream cheese icing, tons of sprinkles and a side of vanilla icecream and is also multi layered that the kids will love so much. This is a home to whimsical décor and incredible array of ice cream treats that is one of the kids favorite snacks. With a visual and culinary delights, the place offer giant hamburger treats, Frozen Hot chocolate. For big spenders, a $1000 Golden Opulence sundae which is listed in the Guinness Book of World Records as the most expensive dessert is found here though you need an earlier reservation. Contact us to find out more about your neighborhood and other top places in America to visit with your kids.